By clicking on the File menu and selecting New → Class. By right clicking in the package explorer and selecting New → Class. By clicking on the class drop down button ( ) and selecting class ( ). Before bringing up the New Java Class wizard, if possible, select the package in which the class is to be created so that the wizard can automatically fill in the package name for you. Select the appropriate class modifier. Enter the super class name or click on the Browse button to search for an existing class. 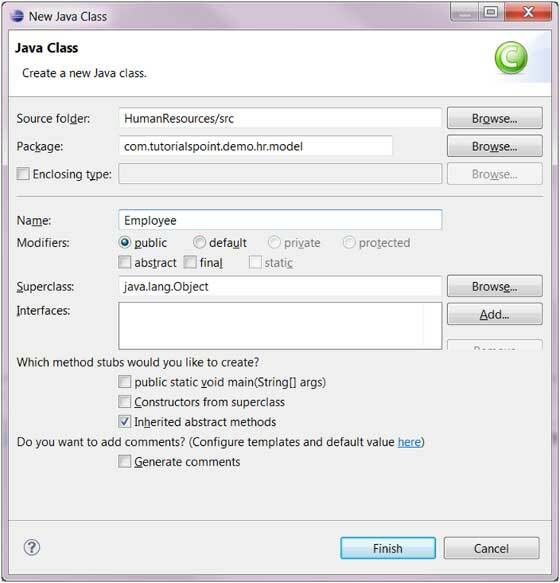 Click on the Add button to select the interfaces implemented by this class. Examine and modify the check boxes related to method stubs and comments. The newly created class should appear in the Package Explorer view and a java editor instance that allows you to modify the new class. It should appear in the editor area.